*..but only if your device has a hard search key! Access the currently open webpage on any other device signed into Google Chrome™. 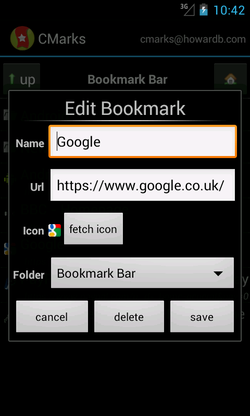 Access your Google Chrome™ Bookmarks on your Android device. 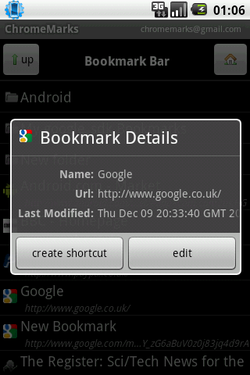 Bookmarks are downloaded to your device and accessible offline. Keep them in sync with your browser(s). No further software, like browser extensions, required. 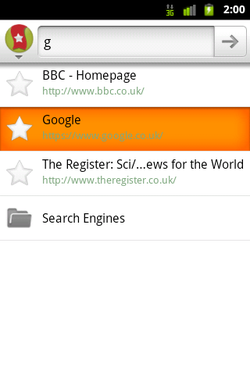 You can search your Google Chrome™ bookmarks and folders from within the app by pressing the search button (or menu, search) or by using the Android Search Widget. To search via the Android Search widget, you need to enable this manually (an Android security feature will not let apps enable this for you). Instructions can be found in the CMarks settings and you simply need to tick a checkbox. 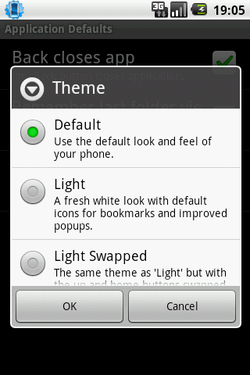 Choose a Theme to apply for the look and feel of the app. Default. Uses the background and text colours from your Android device. Light. A fresher white look with a more professional header bar, default icons for bookmarks with no icon and improved popups. Light Swapped. The same theme as Light, but with the up and home buttons swapped which may be better for righties. The app settings allow you to customise how the app works, with the most popular settings enabled by default. For example, if you don't have much free memory, you can choose to not save icons. Or if you have a limited data plan, specify that automatic sync (*) only happens if the wifi is turned on. 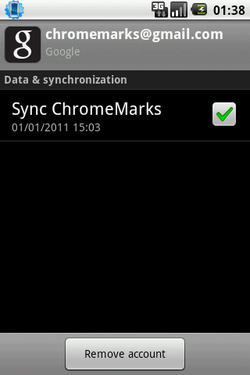 (*) Automatic sync is only available in the full version. 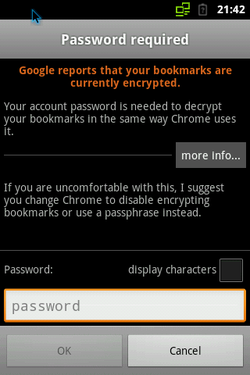 If your Chrome bookmarks are encrypted, CMarks can easily decrypt them automatically. You will, however, need to supply the encryption password or passphrase. For your safety, this is immediately encoded one-way to a secure hash that can only be used to encrypt/decrypt bookmarks. If you don't want to supply your encryption credentials, you can simply disable it in Google Chrome™ and the app will no longer need or ask. 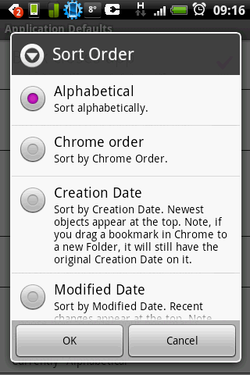 (*) Chrome order available in the full version only. (*) Automatic scheduling with the full version only. 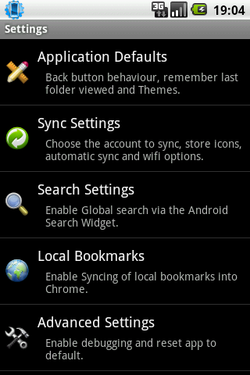 Simply press "sync" in the menu at any time to manually sync and retrieve any changed bookmarks or folders. Please note the Android default is an auto-sync once every 24 hours. 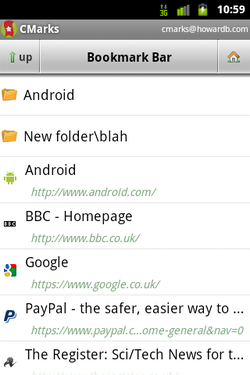 Most Android browsers allow you to "share" a link or a web address. When you do this, you'll get the "share via" popup and you can choose to pass this new link to CMarks and then save it instantly to Google Chrome™. Long press in the Address bar at the top of the screen. Choose the "Share page" option. Long press on a link in a web page. 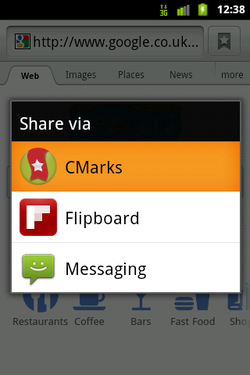 From the context menu, choose "Share link". Long click on a bookmark and select the "create shortcut" option to create a desktop shortcut on your home page to launch your favourite web address. Long click on a folder and select "create shortcut" to create a desktop shortcut on your home page to launch CMarks in your favourite folder. 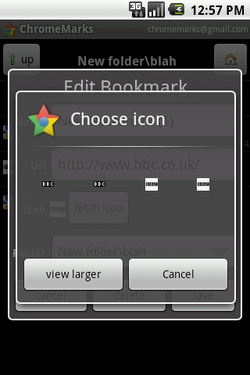 You can choose the icon from a list of presets or the icons of any browsers you have installed on your device. 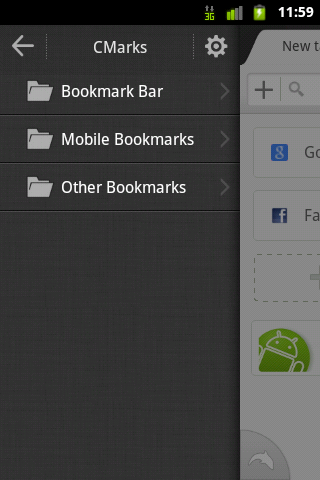 For bookmarks, you can change the folder they are in, the url, the name and you can also choose a different icon. * Except the protected Bookmark Bar and Other Bookmarks folders which you can't edit in Google Chrome™ either. The app can ask four different providers for an icon for your bookmark and you can then choose the one that you like the best and replace any existing icon on the bookmark. Integrate your Google Chrome™ bookmarks and folders into your Stock Browser. Include dummy folders, or prefix each bookmark with parts of the names of the folders it is under. This is currently one way only. If you have a 2.x Samsung device with it's own Folder support, please note that that is proprietary closed technology and this app cannot use the native folder support. 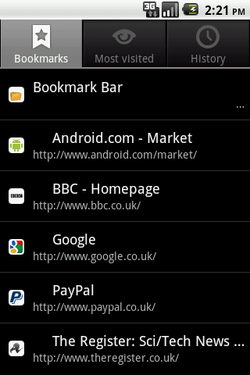 Additionally, if you have a 2.x device, you can choose for CMarks to copy all your Stock Browser bookmarks into a new Folder in Google Chrome™ and then keep them in sync with each other - you can make changes to the bookmarks (the ones visible in your Stock browser) from your Google Chrome™ browser and the changes take effect with the next Sync in CMarks. 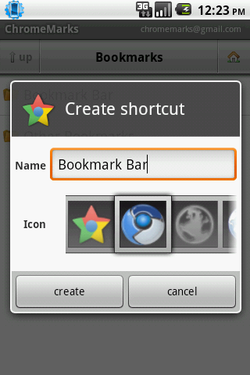 Integrate your full Google Chrome™ bookmark structure into the Dolphin Browser or the Dolphin Browser Beta. Full details and screenshots are available under the "Usage" section on the FAQ/HELP website (click the link from the menu at the top of the page).